Location. This district is in southwestern Plumas County in the general vicinity of the old mining town of La Porte, 25 miles south of Quincy and 50 miles northeast of Oroville. It was one of the great placer-mining districts of the state. History. 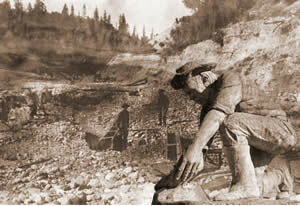 The streams were placer-mined early in the gold rush and were reported to have had very rich yields. The town, first known as Rabbit Creek, was renamed in 1857 after La Porte, Indiana. Hydraulic mining began in the middle 1850s and continued through the 1880s. During this time the district was enormously productive; the output from 1855 to 1871 alone was reported to have been at least $60 million. Appreciable drift mining and some lode mining were carried on. Some mining activity continued until the period of World War I. The district was prospected again during the 1930s, but apparently little mining has been done here since. La Porte was a noted early-day "snowshoe" or ski resort. Geology. The main Tertiary channel of the North Fork of the Yuba River, known as the La Porte channel, extended south-southwest from Gibsonville into this district. From here the channel continued southwest and south again to be joined by a branch from the east from the St. Louis-Table Rock area. The main channel today continues on south to the Poverty Hill and Brandy City districts. At La Porte, the channel is 500 to 1500 feet wide and as much as 500 feet thick. The lower gravels are quartz-rich and up to 80 feet thick. Most of the gold was recovered from near bedrock. The gravels are capped by thick beds of sand and "pipe" clay. During the heyday of mining in the district, these lower gravels yielded from 1/10 to as much as one ounce of gold per cubic yard. To the east the channel deposits are capped by andesite as much as 800 feet thick. Also to the east, considerable faulting has disturbed the channel gravels. Bedrock consists principally of amphibolite, with a one-mile wide belt of slate and quartzite of the Calaveras Formation (Carboniferous to Permian) in the central portion. There are some narrow gold-quartz veins in the district.